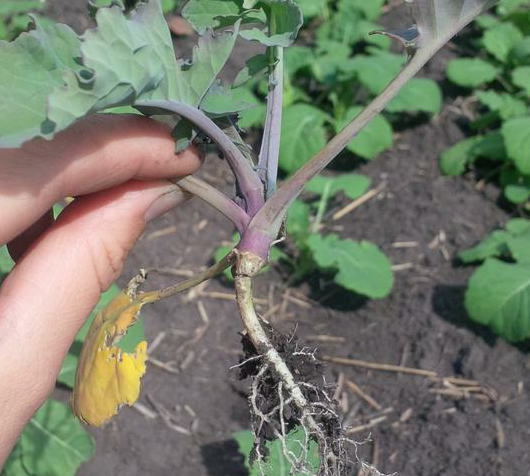 A field has a large number of young canola plants that look limp, pale, chewed-up, knocked around, lifeless and sad. 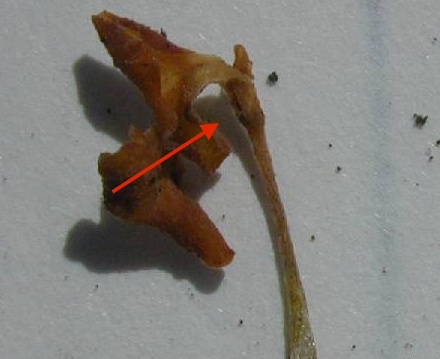 How can you tell if a dead-looking plant still has life? Look at the growing point. Is it green? Are there signs of new leaves beginning? Peel open a few seedlings to get a closer look. 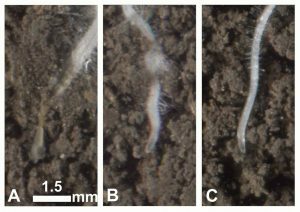 While this examination is lethal, it could indicate the situation for other similar-looking plants in the field. For other similar-looking plants, ring them with a “frost washer”. This frost damaged plant looked dead until a lively new leaf appeared. This one is dead. 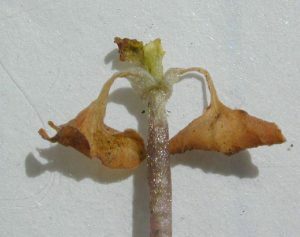 The growing point is withered and brown. Mark plants with a brightly painted washer so you can come back to the exact same plants to see if they lived. The frost washer. 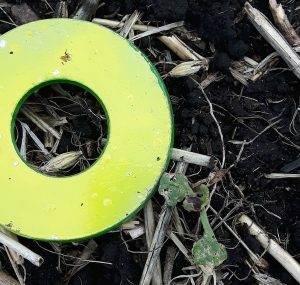 This ingenious idea came from a farmer at canolaPALOOZA in Saskatoon in 2016. He paints washers red, green and yellow and rings them over little seedlings he wants to come back and check again. He puts a red washer over seedlings he thinks are dead, a green washer over seedlings that look like they might live and a yellow washer around seedlings that are borderline. He marks the test spot with a flag or GPS, then returns every few days to check on them. It’s a good tool to train the eye and also make accurate assessment of the exact same plants. CCC agronomy specialists trying their own frost washers this past week found that washer size might be an issue (see the photo above), but a small washer beside a plant worked well. Even a spoon stuck in the ground can mark an individual plant. Use what’s available. In addition, if a field scout were to carry washers around for this purpose, you need fewer washers if you paint them different colours on either side. The plant looks alive now, but could it get worse? That depends on the cause. It-should-get-better causes: Plants still alive after a weather event like frost and hail will continue to recover. If insect threats are over and plants are still alive (even if barely), they should recover. Plants damaged but not killed by spray-tank contamination should live, but wait at least two weeks after the incident. It can take that long for damage to be fully realized. 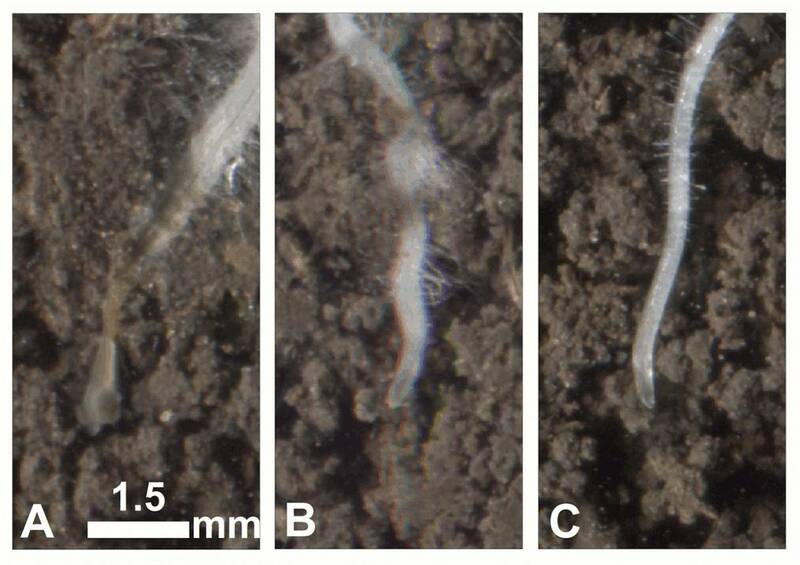 If seedlings survive early injury from seed-placed fertilizer, they should recover. 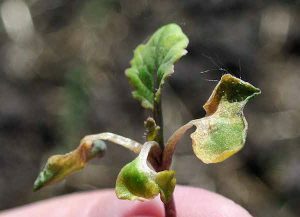 It-could-get-worse causes: Canola with seedling diseases could continue to get worse as the disease progresses. Damage from herbicide residue in the soil could keep getting worse. Plants sitting in flooded soils could continue to deteriorate, and will likely die after 3-5 days. This plant has root rot. It looks OK now but could steadily deteriorate.